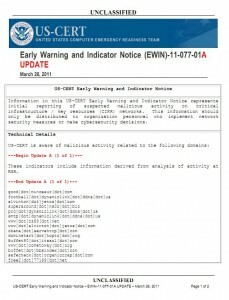 Domains Used in RSA Attack Taunted U.S. 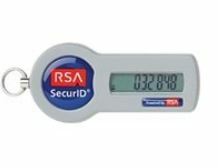 Details about the recent cyber attacks against security firm RSA suggest the assailants may have been taunting the industry giant and the United States while they were stealing secrets from a company whose technology is used to secure many banks and government agencies. That disclosure seems to have only fanned the flames of speculation swirling around this story, and a number of bloggers and pundits have sketched out scenarios of what might have happened. Yet, until now, very little data about the attack itself has been made public. Earlier today, I had a chance to review an unclassified document from the U.S. Computer Emergency Readiness Team (US-CERT), which includes a tiny bit of attack data: A list of domains that were used in the intrusion at RSA. Most of the domains trace back to so-called dynamic DNS providers, usually free services that allow users to have Web sites hosted on servers that frequently change their Internet addresses. This type of service is useful for people who want to host a Web site on a home-based Internet address that may change from time to time, because dynamic DNS services can be used to easily map the domain name to the user’s new Internet address whenever it happens to change.